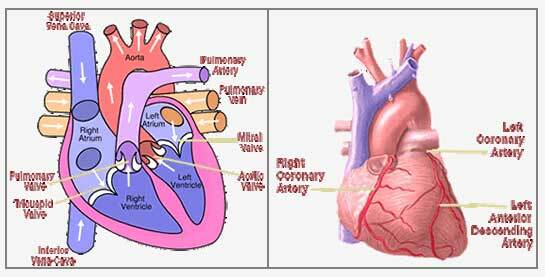 Different test give us different information about the heart. Some find it easy to think of the heart like a “house” with rooms or chambers, an electrical system and a plumbing system. Here are a few tests that tell us about your hearts structure and function. SPECIAL PACKAGE: We offer a Cardiovascular Imaging Package that is non-invasive and radiation free. The package includes seven key tests at a reduced package rate. Link here for details. The function of your heart valves. Heart valves can be too tight, called stenotic or leaky called regurgitation. Has the heart muscle been damaged from a heart attack? What are the pressures inside the heart? Nuclear imaging is a test that uses a radioactive tracer to assess blood flow to your heart muscle. This test helps us to determine if you have a blockage in one of the coronary arteries. Different radioactive tracers can be used. They include technetium, thallium and more recently rubidium. Rubidium is the most sensitive and specific for determining blood flow to the heart muscle. The rubidium test is performed in a PET (Positron Emission Tomography) scanner. Nuclear imaging can be performed with exercise. With an exercise nuclear study, you walk on a treadmill and images are taken of your heart before (rest) and after (stress) exercise. These images are compared to determine if you have blockage in a blood vessel. If you cannot exercise on the treadmill, the same test can be performed using a chemical. This is called a chemical stress test. This test involves walking on a tread mill. With exercise we monitor your heart rate and blood pressure. We can determine your blood pressure response to exercise. The electrocardiogram (EKG) is evaluated to determine blood flow to your heart muscle. While this test is reliable in men, it is not as reliable in women. Women, suspected of having a cardiac problem, are better served with nuclear imaging especially using rubidium in a PET scanner or stress echocardiogram than exercise treadmill test only.. This test combines exercise with echocardiography. The movements of the heart muscle walls are evaluated with the echocardiogram before and immediately after exercise. A weakness in the heart muscle after exercise suggests a blockage in the artery supplying that wall. This test can also be done chemically, if you are unable to exercise. When performed chemically, it is called a Dobutamine Stress Echocardiogram. Determination of Coronary Calcium. Calcium should not line the vessels of your heart. If we find calcium in the arteries, it increases your risk of a major cardiac event such as a heart attack. Coronary calcification can be prevented through lifestyle change with diet and exercise, nutraceuticals, stress management and medication. Determination of Blood Flow to the heart muscle. Determination of the Coronary Anatomy, also called angiogram. In less than 30 minutes we have all the information needed to determine your risk of a future cardiac event. Endothelial testing (EndoPat): This non-invasive test helps diagnose early heart disease in the lining of the blood vessels — the endothelium. Normal endothelial function protects the blood vessels from developing atherosclerosis. In this test, detectors are placed on the finger tips and a blood pressure cuff occludes blood flow to the arm for a few minutes. When the cuff is released, it measures how the blood vessels respond to the reperfusion. This test is highly useful in detecting early coronary artery disease (CAD) and is especially relevant to women because women have higher rates of endothelial dysfunction and microvascular disease.